It seems that people from Just eat too thought the same and they deliver delicious food from your neighbourhood restaurant to your home!! Where were you guys when i needed you?! Anyways, better late then never!! There are still some days when the home is full of guests, who want different things for their meal (and it happens often at my home)!! I am so going to use their service on such days.. 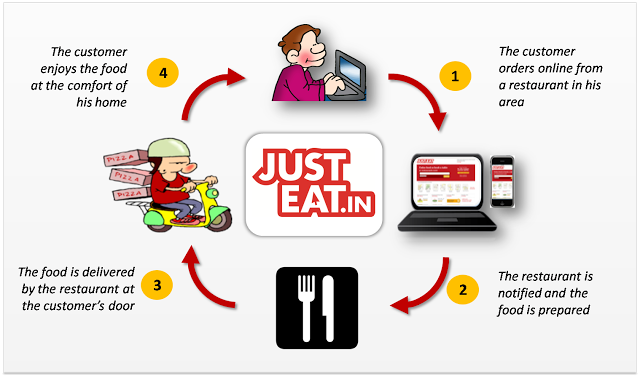 I was requested to try their service and do a review… So here is my Just eat story!! Yes, yes it’s a story…read on!! So, i get a Voucher from Just eat so that i can order and try their services. Next day i declare a kitchen holiday and proceed with ordering. I open the Just Eat website for Delhi-NCR and go on the order page. i go about placing the order and then select cash on delivery option and check out!! I receive a call from their customer service to confirm the order. I confirm it. But finally i placed another order and made online payment which went through smoothly and i received hot food at my doorstep from my neighbourhood eatery!! In the story i loved two things!! The very efficient customer service of Just eat (at least i had a great experience with them) and THE FOOD DELIVERED AT HOME!! There are other things too that you may love about Just eat. Like they give option of online payment/cash on delivery. Like they have apps for android and i-phone, so you really need not log into your comp to order the food!! Like they have huge number of restaurants (2500+ i am told) on their list, so you are bound to find one around you!! And there are discount coupons!! We do have such service with the same concept over here. Certainly like you said, there are days when entering the kitchen and cooking a meal can be tiring after slogging at work. The thing is that I am staying somewhere away from the city, so my area is not covered. Thus, something simple or leftovers are usually what I eat. yup..totally agreet o you…some days when we are crap n tired..and the bestest thing to happen wud be some lovely food reaching out to us at teh doorway ! Didn't see any post from long time…hows going on your business?